Sep - 14 | By: Oregon Film | 4 comments. It’s always great to hear of projects choosing to shoot in Oregon and when we heard about the producers of the documentary, Half Way Home, choosing the Ashland area over their native LA for some of it’s scenes, we learned the reasons in this case were threefold; less expensive, less red tape and solid talent. 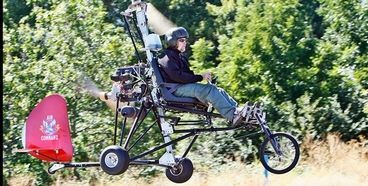 Gary Kout, producer and executive director of the Southern Oregon Film and Television organization, connected the producers with talented auto-giro pilot, Shawn Adams (Rotor-Head) in southern Oregon to get their tricky arial scenes. For more on this story go here. Another example that the tax credit-financed film subsidy cannot take credit for every shoot in Oregon — here you and the original article note that it was less red tape for the filming, less expensive (auto-gyro vs. helicopter) and good talent (like Shawn Adams). It is nice to see the honesty out of the Oregon Film and Video Office. Hopefully that will continue when the legislature reviews whether the subsidy fund ought to be part of the general fund and not funded with a generous and expensive tax credit program that loses $5 for every $95 the subsidy fund spends. We are happy to celebrate projects no matter how big or small. And we’re grateful to have someone like Shawn Adams working in Oregon. In this case the project is a very small and low economic impact project. The facts show that in today’s competitive environment if a state wants to attract any significant projects that bring hundreds if not thousands of jobs to its region, an incentive program MUST exist. There is only one place in the U.S. and Canada that receives ANY significant work without some sort of incentive program – Las Vegas, Nevada. From our perspective we can either have an incentive program or we can build the Las Vegas strip to get the projects. Otherwise the production resources and talented crew base will leave the state which will make it even more difficult to make this a film friendly state. Wow! I’m honestly surprised at the vitriol in your comment, Chuck. I don’t think anyone’s ever said that there would be NO production in Oregon without the film incentive program – as the site admin said above, Oregon works very hard to make itself a friendly place for outside producers AND local producers to create their product. That being said, I note that the article linked to doesn’t mention the number of local workers employed on this shoot. Judging by the story’s description of the shoot, it doesn’t sound like Half Way Home is going to be employing the 200+ Oregonians Leverage hired for its recently-wrapped season (http://orfilmandtvdollars.wordpress.com/2010/08/31/portland-mayors-office-says-the-city-and-leverage-have-a-good-thing-going/), and it certainly doesn’t sound like this production is going to be purchasing $20 million worth of goods and services from Ashland. Don’t get the wrong idea, I’m not bringing this up to denegrate Half Way Home – I’m pointing out that there’s a big difference between small productions like this and productions of the scale that Leverage and Twilight operate under – productions that would NOT have brought their business to Oregon if we didn’t have our film incentive programs. In fact, Oregon’s incentive program is comparitively small when compared to many other states – hence Twilight not returning to our state for the following three movies in the series. I’m in agreement with you on one thing, though, Chuck – I hope the legislature takes these numbers into account when deciding to renew (or increase) these programs that have brought millions of dollars into our state and employed hundreds of our citizens.